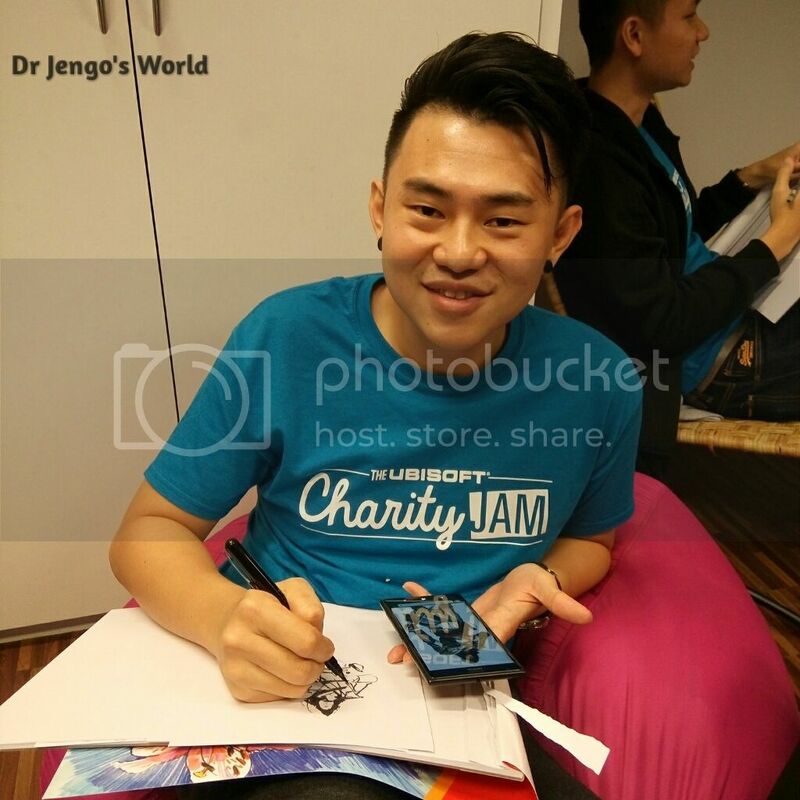 Dr Jengo's World: Ubisoft Singapore's Charity Jam 2015 pics and loot! 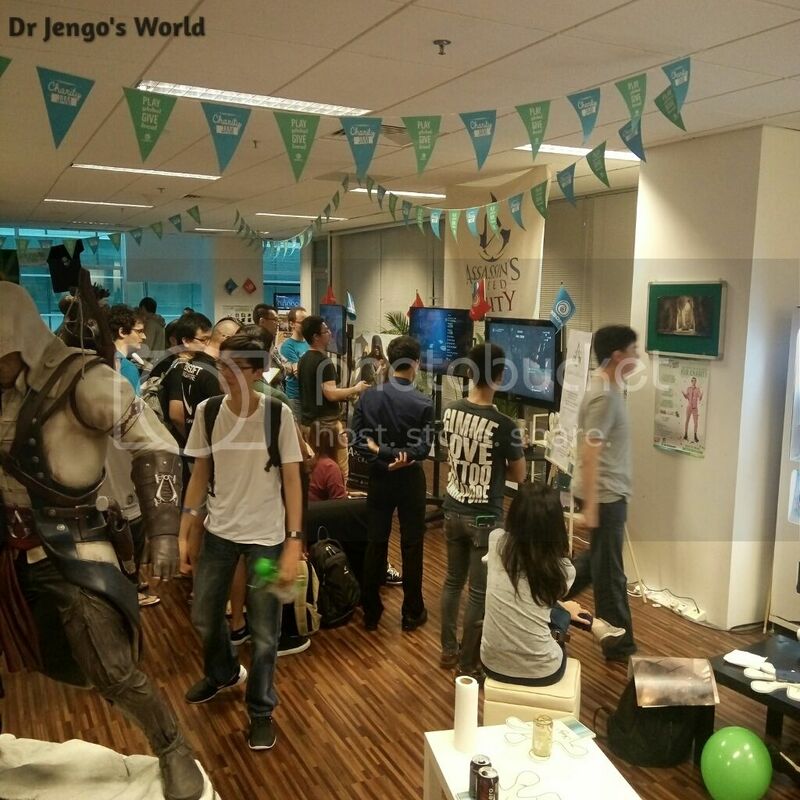 Ubisoft Singapore's Charity Jam 2015 pics and loot! 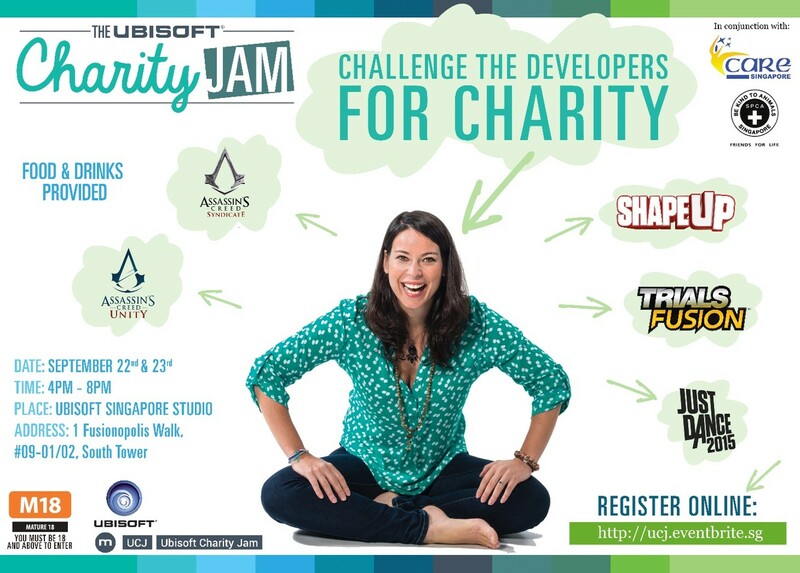 Ubisoft Singapore opened their doors to the public, for the first time, for their Annual Charity Event! There were plenty of games, fun, prizes and merchandise, all for a good cause. Funds were raised for Care Singapore and SPCA Singapore. 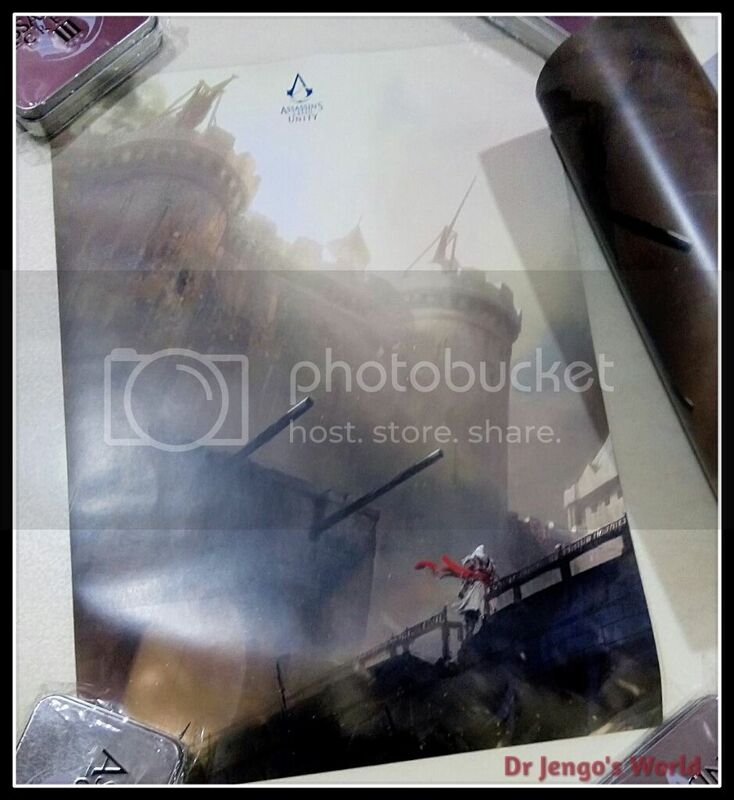 I was there early on the first day with a friend and we got a free AC Unity concept art print and some postcards as door gifts. Love that art print! 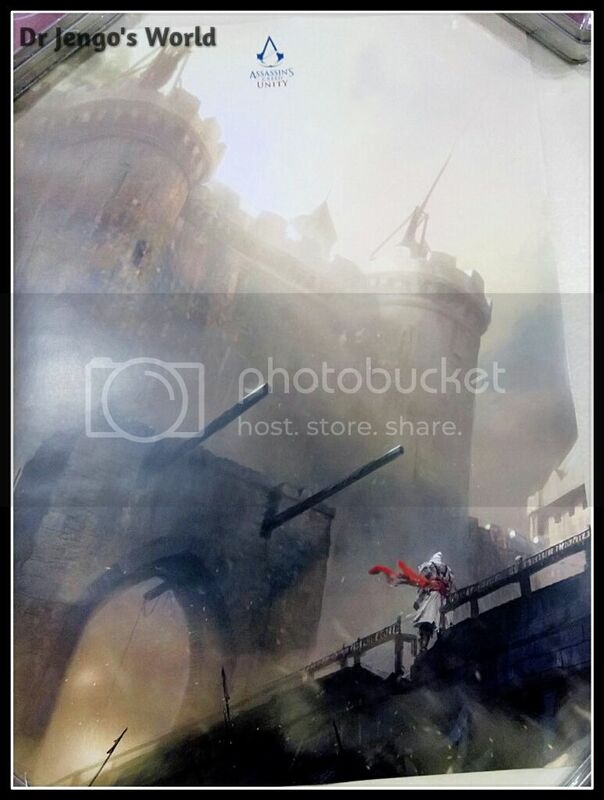 Beautiful concept art of The Bastille (I believe), having scaled it so many times in the game. 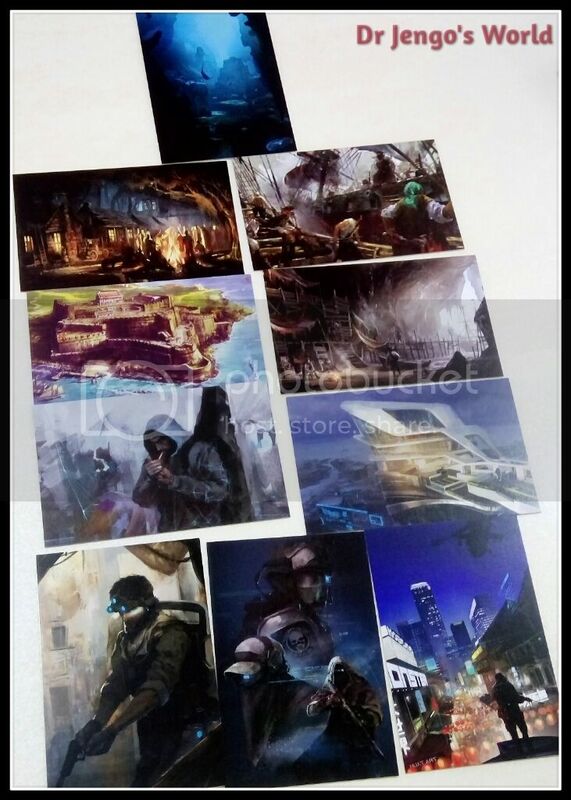 The art on the postcard above looked very familiar.. and when I opened them back at home..
Ahh yess... some of the concept art from the "Art in Video Games" exhibition by Ubisoft Singapore back in 2013. If you click the link, you will see Kobe doing a live presentation and I was glad to be able to meet and have a small chat with him at the Charity Jam. 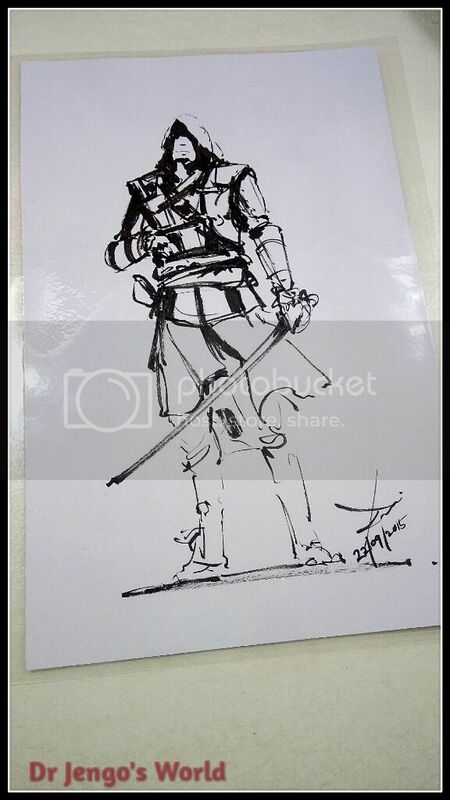 Here's Kobe, the Associate Art Director at Ubi SG, doing up a sketch for me of Edward Kenway. Who better to draw Edward Kenway, than the man himself?! While he was working on the sketch, we talked about how he joined the industry and Ubisoft Singapore and also found that he is a big fan of Prince of Persia as well and his wish is to be part of the team that reboots the franchise. Sir, I wholeheartedly wish you all the best in that! Here's how the sketch turned out..
Amazing! 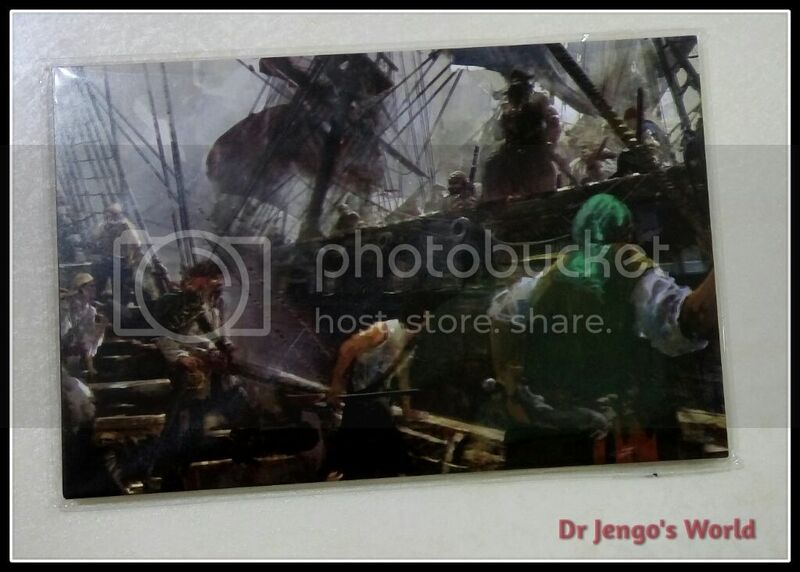 Friendly peeps at the studio got it laminated for me and it's going to be a nice memory of my visit to the Studio. Got another sketch done by Shamine, Concept Artist at the Studio. 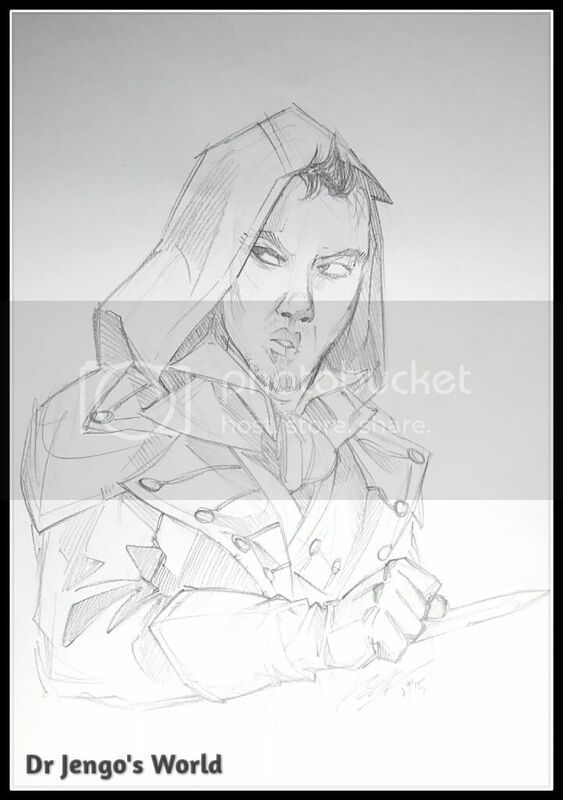 She had a tougher challenge, drawing me as an Assassin and here how it turned out..
Wow.. I was blown away! I loved how she gave me that mean look under that hood.. I'm sure I was giving her that look so it was amazing how she imagined it on me. Another cool memory to take away! Went on to try some games and played some AC Unity. Less than a year, and I was so rusty already. Doesn't help that I was playing AC IV recently and the controls are quite different. Got the hang of it quick though and submitted my best score, out of 3 tries, for the challenge. Now to hope for the best.. There were other game challenges, Trials Fusion, Just Dance, ShapeUp. Honestly, not my type of interest.. I was more interested in something else.. I bought some merchandise, to do my part for charity, and to add to my collection. 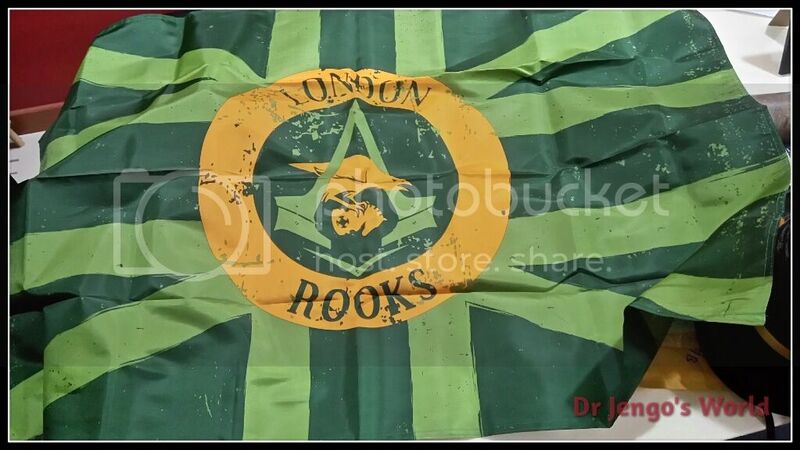 Rooks Flag, same one as the one from GamesCom 2015! Signed by several members of the team and some nice messages too! 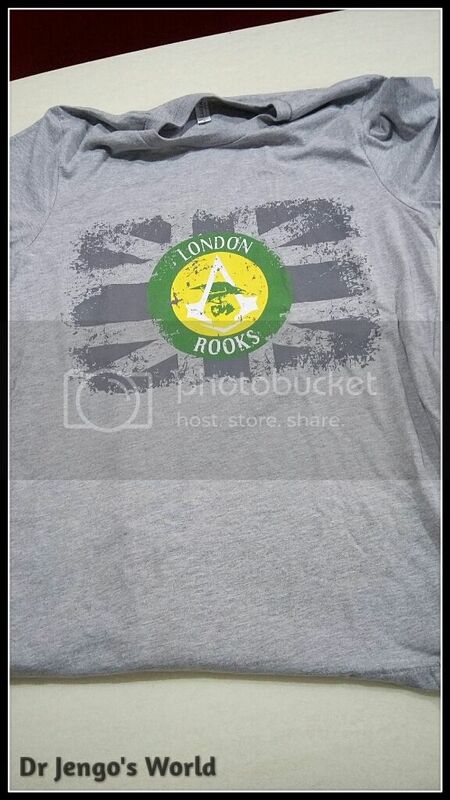 Not the plastic one from the Rooks Initiation Kit, given out at SDCC 2015 but this is made of 100% Polyester. Really good quality stuff! So, yes instead of playing games.. 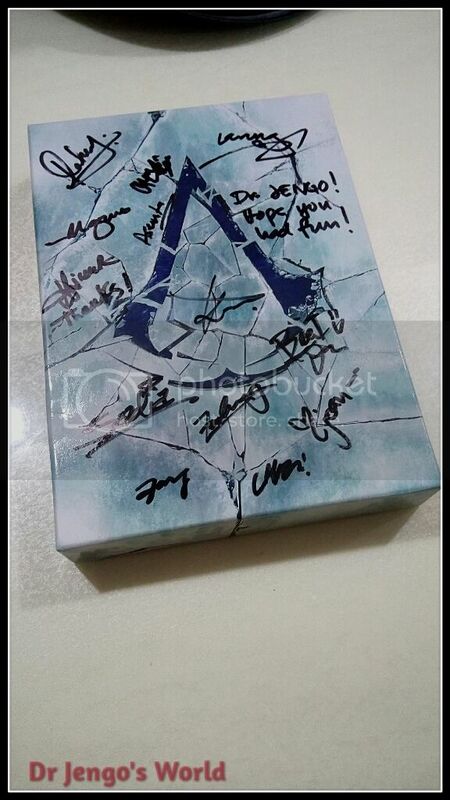 I was walking around meeting the developers and staff, to get some stuff signed, including the AC Rogue Collector's Edition. 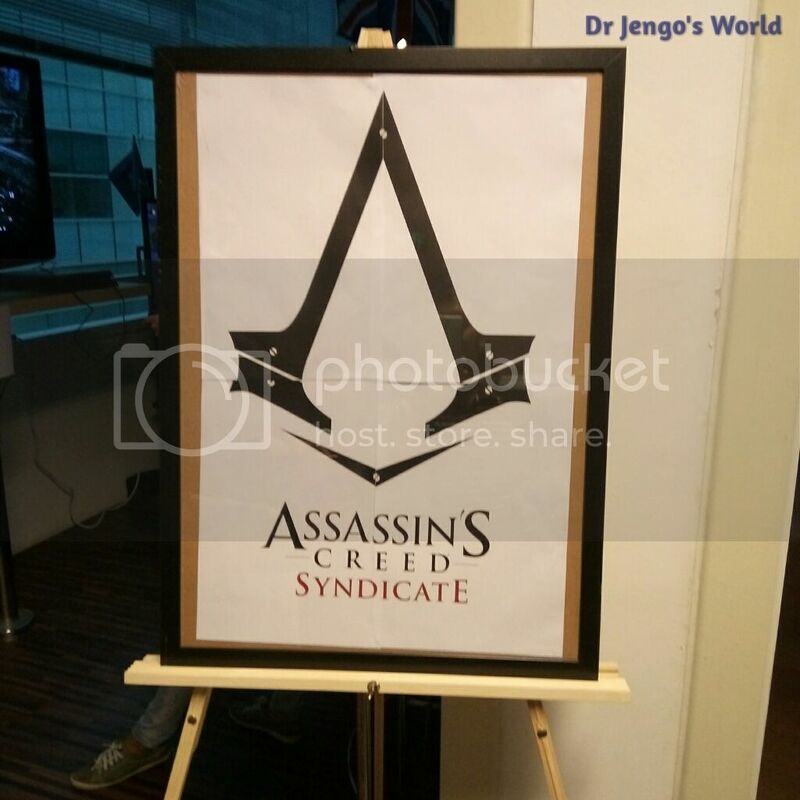 Had an amazing time, meeting many of the developers from the teams that worked on AC Rogue and AC Syndicate.. Some faces and names I remember.. Showed them some pics of my collection and they were impressed! 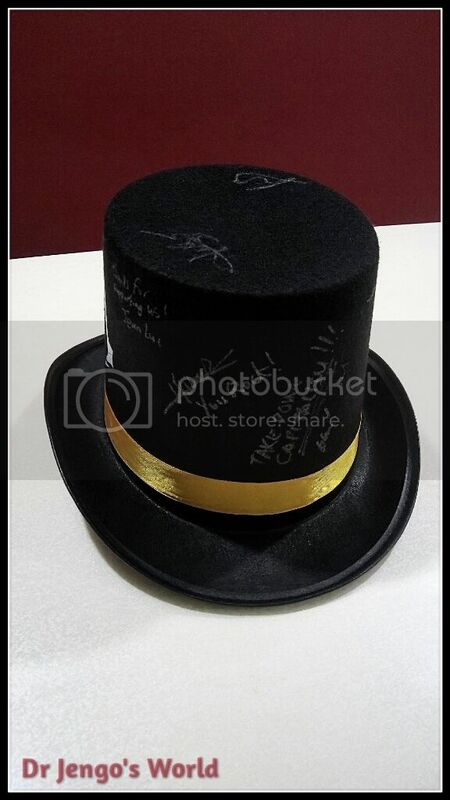 And I was so lucky to meet the Producer, Justin Farren, who gave this to me personally! Been hunting for this for quite a while now, so I was really lucky to receive this! 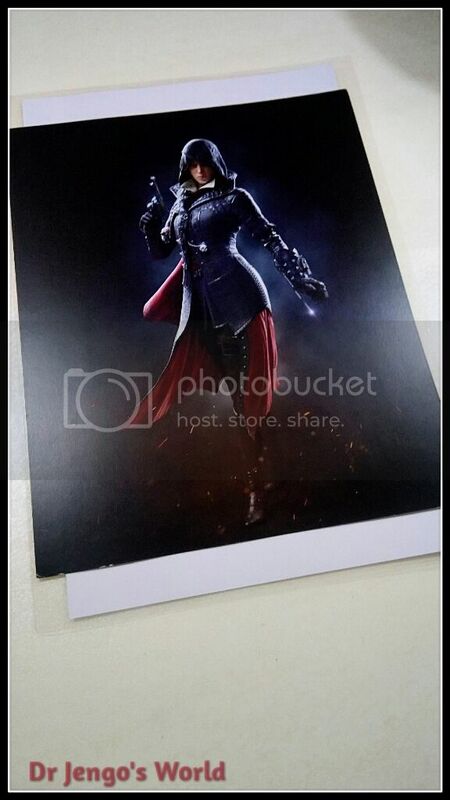 This was at the AC Syndicate booth, while we queuing to try out the game. Will talk about my thoughts about the demo and some of the info I learnt from the developers in another blog post. Time flew and before we knew it, it was almost over.. Not before the prizes were announced! Met a friend from one of the Playtests I did with Ubisoft Singapore and he dominated with several wins on the Challenges. 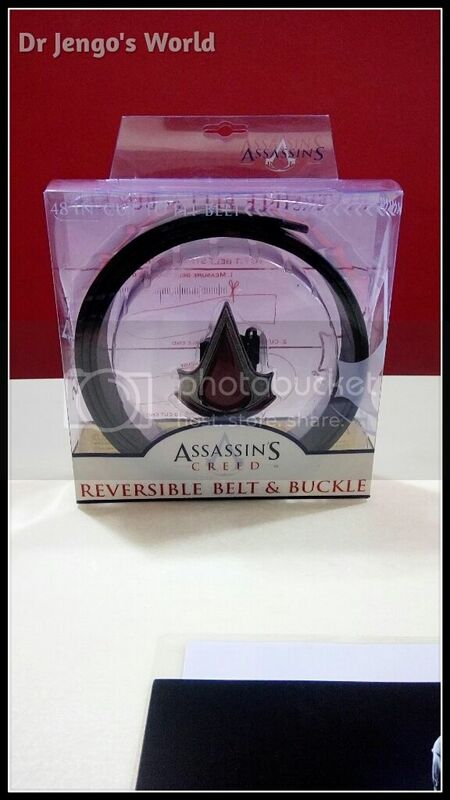 I got 3rd in the AC Unity Challenge and snagged this awesome belt! Cool stuff and that's all for Day One! Had a lot of fun so I came back for Day Two! This time a bit later, after work. Didn't play as much AC Syndicate as I would have liked to, on the first day, so I went all out this time. Tried all the different approaches and even some horse carriage-hijacking! (More on these on another post). Another friend joined me later on, and I urged him to try AC Unity and he got 2nd prize on the Challenge! Congrats to him! 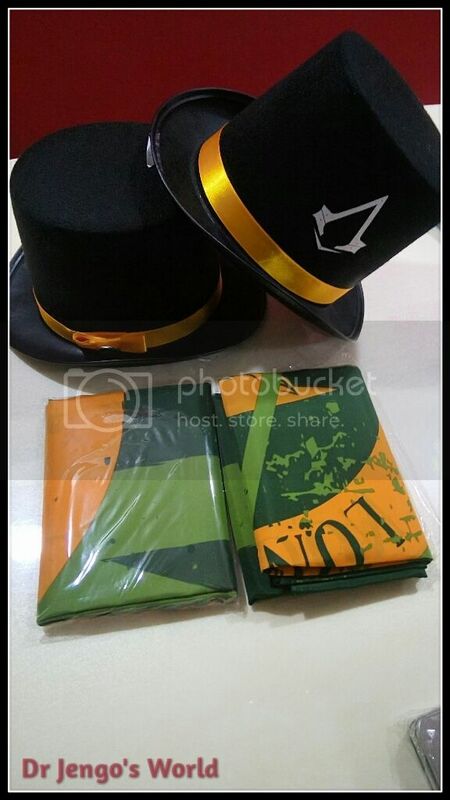 Coincidentally, met another friend at the event and we talked a lot about our collections and Assassin's Creed in general. Nice to see you again Axley, and I love your passion for gaming & collecting! That's all for Day 2 and the Charity Jam 2015! 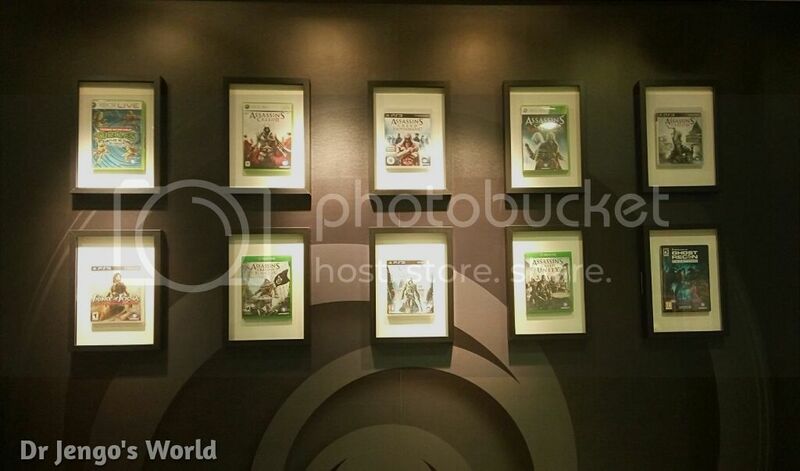 A quick pic of their Wall of Fame as we left..
Once again, all my loot! 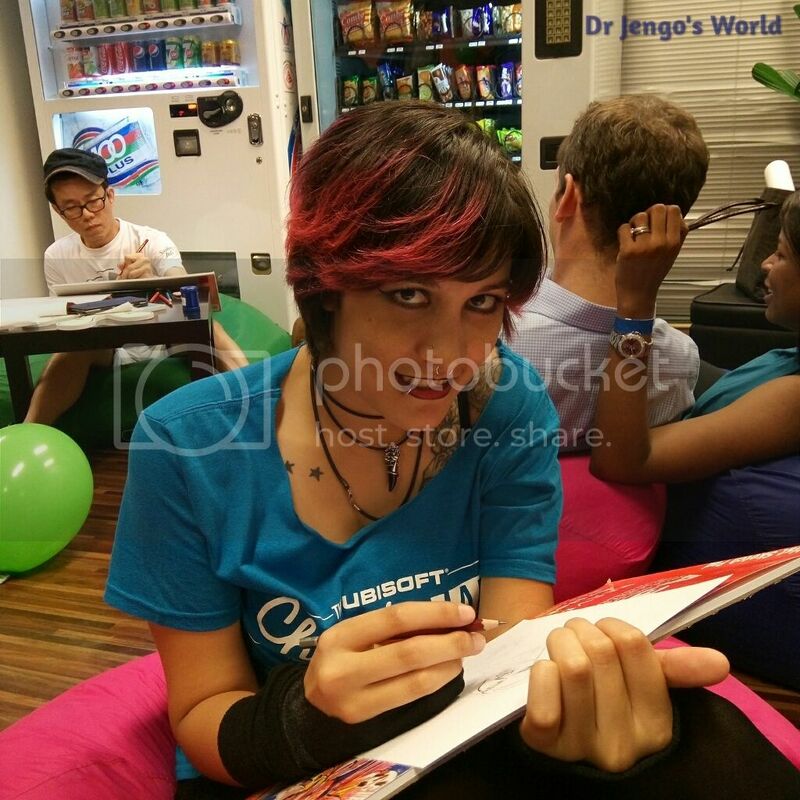 Thank you Ubisoft Singapore for the wonderful time! 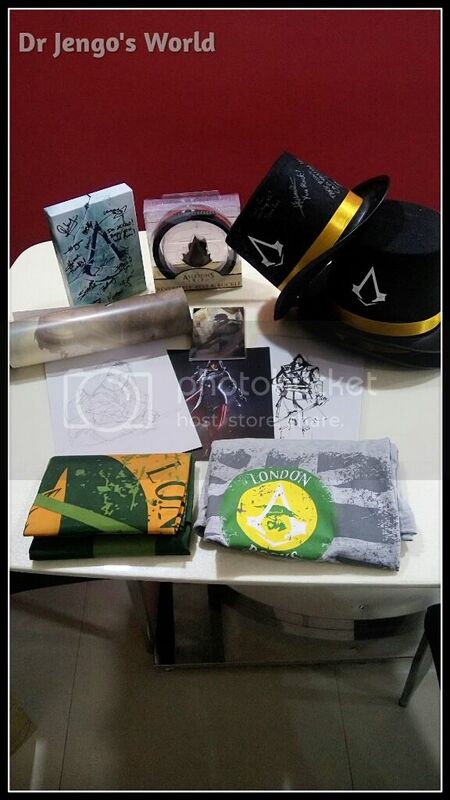 Really hope to join you guys in 2016 again, with just as much games and not forgetting the merchandise. Plenty of gamers here, but don't forget the collectors!